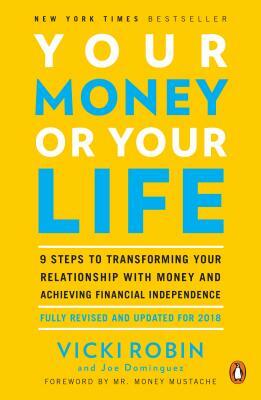 For more than twenty-five years, Your Money or Your Life has been considered the go-to book for taking back your life by changing your relationship with money. Hundreds of thousands of people have followed this nine-step program, learning to live more deliberately and meaningfully with Vicki Robin’s guidance. This fully revised and updated edition with a foreword by "the Frugal Guru" (New Yorker) Mr. Money Mustache is the ultimate makeover of this bestselling classic, ensuring that its time-tested wisdom applies to people of all ages and covers modern topics like investing in index funds, managing revenue streams like side hustles and freelancing, tracking your finances online, and having difficult conversations about money. Vicki Robin is a renowned innovator, writer, and speaker. In addition to coauthoring the bestselling Your Money or Your Life, Robin has been at the forefront of the sustainable living movement. She has received awards from Co-Op America and Sustainable Northwest and was profiled in Utne Magazine’s book Visionaries: People and Ideas to Change Your Life. She is also the author of Blessing the Hands That Feed Us: What Eating Closer to Home Can Teach Us About Food, Community and Our Place on Earth. She lives on Whidbey Island in Washington. Joe Dominguez (1938-1997) was a successful financial analyst on Wall Street before retiring at the age of thirty-one by following the nine-step program he formulated for himself. He taught this formula for many years, and preserved it for future generations in Your Money or Your Life. From 1969 on, he was a full-time volunteer and donated all proceeds from his teaching to transformational projects. Peter Adeney, better known as Mr. Money Mustache, is an influential financial blogger who retired financially independent shortly after turning thirty, and now writes about how to live a frugal life of leisure. "If you want to invest in your financial future and (more importantly) your long-term happiness, I can’t think of a better investment than Your Money or Your Life.” —Brandon Ganch, "Mad Fientist"
"[Your Money or Your Life] changed my life...I started believing that my life controlled my money. I began to see my life without the weight of debt and the need to chase a paycheck because I actually understood the path to get there." -Trent Hamm, "The Simple Dollar"